This is what happens when you read the cereal box. 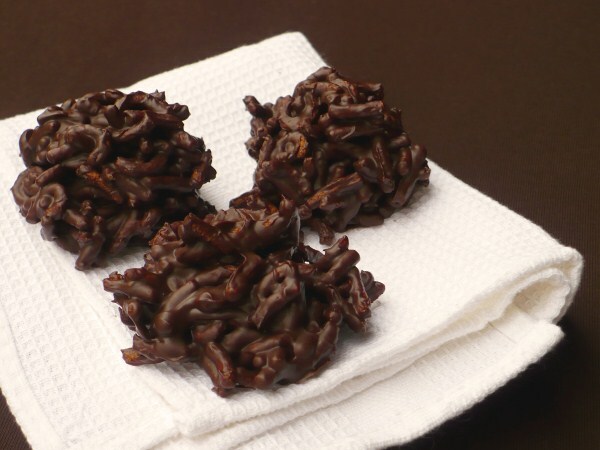 I saw the recipe for these on the side of a box of Original Fiber One and they just sounded good. I've been craving chocolate lately and these are actually pretty healthy for you. Lots of fiber! Only 3 ingredients and no baking make these an easy treat. The box calls these "haystacks" but I think "bird nests" is better. 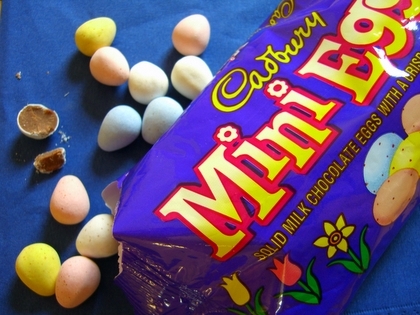 These would be super cute around Easter time with some Cadbury Mini Eggs (you know, those chocolate candies that look like little robin's eggs?) pressed in the center. The original recipe calls for 1/2 cup of peanut butter, but I found that it softens the chocolate a little too much - these melt in your hands pretty easily. So I decided to reduce the amount of peanut butter to 1/4 cup. Even less fat that way and they still taste yummy. And I feel no guilt when I eat more than one. Check the link below for nutritional stats. Line two cookie sheets with waxed or parchment paper. In a microwave-safe bowl, heat chocolate chips and peanut butter on HIGH 1 minute, stirring after 30 seconds. Microwave 30 seconds to 1 minute more, stirring after every 15 seconds, until melted and smooth. In a large bowl, stir together cereal with chocolate mixture until evenly coated. Drop by rounded tablespoonfuls onto lined cookies sheets. Refrigerate until firm. Store in an airtight container in the fridge. I got 18 "cookies" out of this, but I made them a little big.